All-flash arrays generally offer very good performance and low latency when deployed as a primary data store. They are also very good in niche use cases where I/O patterns are read-intensive and working sets are small (e.g. RDBMS, ERP/CRM/SCM). However, as an all-flash array approaches full capacity, there can be significant performance degradation as “write cliffs” can occur under heavy write I/O loads as intensive garbage collection is required to free blocks for write. Also note that many all-flash arrays are still based on a traditional active/passive dual controller, RAID-based architecture, posing the same risks of controller bottlenecking and significantly degraded performance in the event of controller failure, as well as rebuild vulnerabilities. In order to approach cost parity with HDD-based solutions, most all-flash arrays are heavily dependent upon data reduction technologies (notably compression and deduplication), which are both inherently resource intensive and tend to exhibit deteriorating efficacy over time as the array is loaded. When it comes to reliability metrics, all-flash arrays are reaching “par” with those seen on traditional mid-range arrays: 5-9’s, Dual Controllers, Long Rebuild Times, making it easier for customers to consider an equal solution when compared to mid-tier hybrid arrays. However, all-flash arrays are nowhere close to delivering 7-9’s of availability because many are dual-controller and active/passive. For comparison, a flash-optimized hybrid array like INFINIDAT’s is 100x more reliable at that scale. Also note that NAND is inherently more prone to cell deterioration and requires complex mechanisms to approach disk reliability levels. Subsequent chip generations generally have lower reliability than previous generations, requiring all-flash vendors to continually invest increasing amounts in mitigating the raw resiliency weaknesses of their raw chip building blocks. While the cost of flash still exceeds that of spinning media, the economics can be improved with data reduction technologies that help drive the cost of flash closer to price parity with HDD based on current areal densities. It is also important to note that these data reduction technologies tend to be very in-deterministic and have not brought the cost curve in line with HDDs today. In addition, advancements in HDD technology will drive ever higher levels of areal density. This will help with the overall capacity economics, and leave all-flash arrays to continue to be relegated to only the areas where high performance is the only criteria. All-flash arrays have the benefit of delivering high performance at a relatively low entry point configuration. This is because most all-flash arrays (as in traditional arrays) permit capacity to be scaled up independent of front end performance. When it comes to capacity-oriented workloads, HDDs are still the preferred architecture, as technologies like technologies like HAMR and TDMR1 will continue to drive areal density higher. The continued migration of flash closer to compute in both base server and converged system configurations may reduce the long-term viability of flash as a shared primary data store. 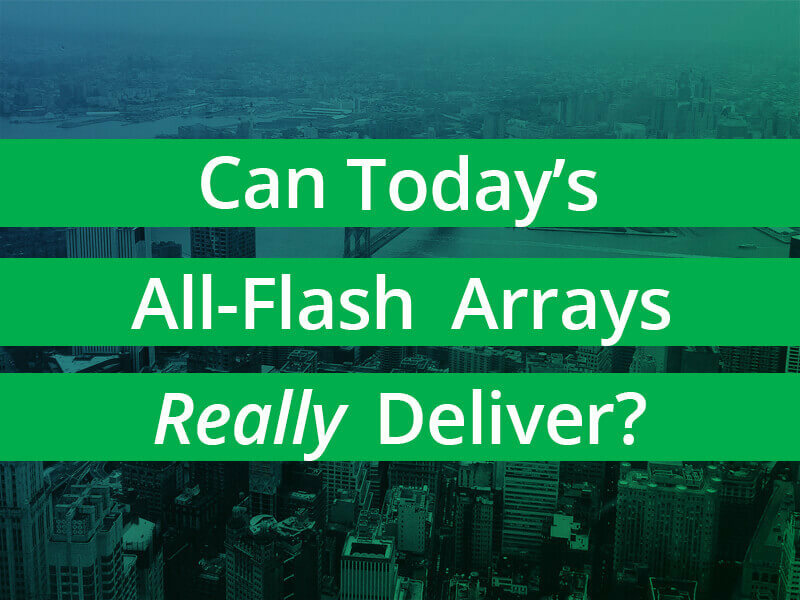 Contemporary all-flash arrays do offer well-designed, fairly intuitive management interfaces and normal management and implementation operations are inherently faster in some cases than on a traditional HDD-based array. All-flash arrays can produce “forced heterogeneity” because it is not economically feasible to move all workloads to all-flash, most customers are forced to add all-flash arrays to an existing infrastructure comprised of other storage arrays, necessitating adoption of a new, unfamiliar management interface and workflow. While all-flash arrays definitely have their place and are well-suited for certain workloads, they will continue to be best suited for specific performance oriented workloads.The all-flash data center, while desirable on paper, will not be a viable option for a vast majority of organizations in the foreseeable future. It would simply ‘break’ the IT budget and introduce unnecessary risk and complexity into the data center. This piece was excerpted from the executive brief titled “INFINIDAT Flash-Optimized Hybrid Array vs. Current All-Flash Arrays (AFAs).” Download the executive brief to learn where and how these solutions are best utilized in the data center. Randy Arseneau is Chief Marketing Officer at INFINIDAT. He has been involved in information technology management for over 28 years in roles including developer, DBA, architect, performance engineer, strategic planner and senior executive. He began his career with a ten-year stint at Motorola, and later spent nine years in various management roles culminating in Director of APM Systems Engineering for VERITAS Software (via its acquisition of Precise Software). Randy has also been active in leadership and advisory capacities for a number of emerging technology startups. Randy joined Infinidat from Nutanix, where he ran the global sales enablement team during a period in which the company grew from an annualized run rate of $150M to over $500M in revenue, and more than tripled headcount to over 1,100 employees worldwide.